Do you have a passion for advancing technology for humanity? Do you do hands-on technical work? Are you relatively young with not a lot of industrial experience? 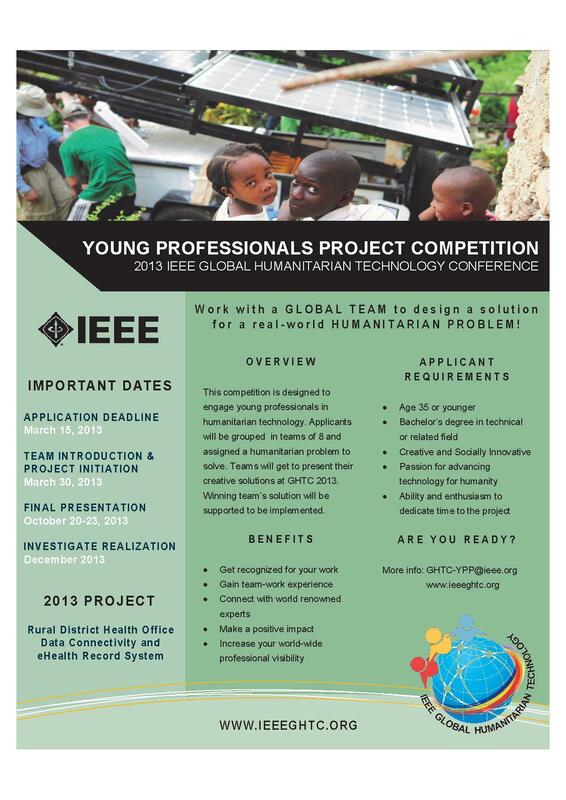 If you answered YES to all questions above, you are invited to participate in the IEEE Global Humanitarian Technology Conference Young Professional Project Competition. Get your hands on improving access to healthcare. The project solution may be applicable to any rural area, not specific to any geographical region. Especially if you are thinking about getting your foot into similar fields, this could be a stepping stone for you. Did you enjoy IEEE GHTC 2012? Or you wanted to join us but couldn’t make it? It’s time to start planning for IEEE GHTC 2013. This year, we are moving to the technology and innovation breeding ground – Silicon Valley, California USA – where good technologies always catch some eyes. The next one may be yours! Now inviting paper submissions, IEEE GHTC will focus on addressing pressing humanitarian challenges and issues anywhere in the world, developed and developing countries. Come join us to make the world a better place enabled by the relevant knowledge, skills, and technology. Recognizing the potential for humanitarian works in South Asia region and the high quality of papers submitted in the past, IEEE GHTC is holding its first satellite conference as mentioned before. Consistent with the IEEE GHTC objectives, IEEE GHTC-SAS will focus on addressing pressing humanitarian challenges and issues in South Asia. IEEE GHTC-SAS is now inviting paper submissions. Come join us to make South Asia a better place enabled by the relevant knowledge, skills, and technology. 2013 will mark a big step for IEEE Global Humanitarian Technology Conference in 2 ways. Why? IEEE GHTC will hold its first satellite conference. We want to double the fun, double the positive impact, double the benefit to humanity, to our world. IEEE GHTC is launching its first Young Professional Project Contest.